Being a gamer or a designer or even just a regular user, it is annoying when you don’t get the best of your content. While most blame the overall resolution of the screen, most of the time this is caused by a lackluster graphics card. If you already have your own graphics card and still are not satisfied with the quality, then maybe it’s time you think of an upgrade. The 1080 Ti graphics card is exceptional when it comes to providing quality performance as well as cooling management. In this article, we will feature the best 1080 Ti graphics cards that cater to your graphics-intensive tasks. What are the best 1080 Ti graphics cards in 2018? The market is full of graphics cards. Out of thousands of selections, 1080 Ti graphics cards remain to be the gold standard in terms of providing sheer speed and power, especially when it comes to gaming. Luckily, you don’t have to stick to a single brand to purchase a 1080 Ti graphics card. There are several manufacturers that churn out their own version of the graphics card. Here are the ones that stood out for us amidst a sea of 1080 Ti graphics card that was released in 2018. 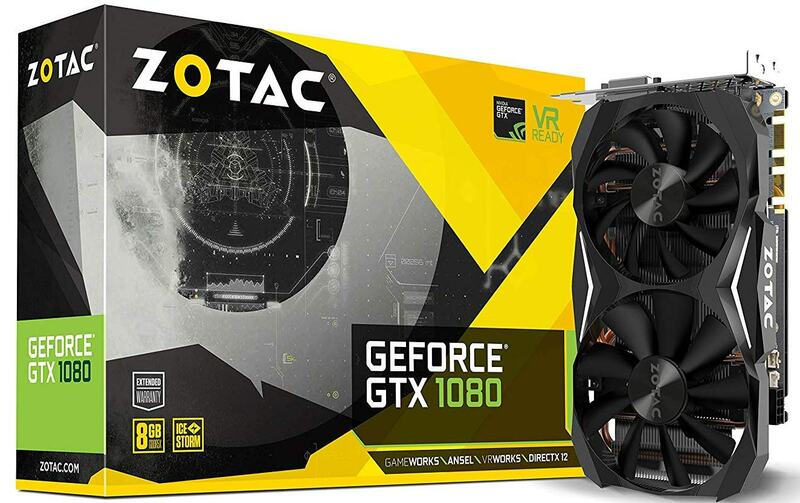 Starting our list is one of the best graphics card offerings by a brand named Zotac. Although relatively new to the industry, the company has produced high-quality computer parts which made them comparable to other well-renowned brands. The company first had its humble beginnings in 2007. Now, they are one of the stable manufacturers of Nvidia graphics cards. As the name implies, the Zotac GeForce GTX 1080 Ti Mini is intended mini in size. It is in fact, one of the most compact version of this efficient graphics card. The form factor might be small and compact, but the company managed to fit in all the important components which include the dual fans which are effective in keeping the temperature at decreased levels. This product can fit most computer rigs that are available in the market. In terms of design, the Zotac GTX 1080 Ti mini sports a minimalistic look. It opts for a dark grey color which is complemented by detailed accents in the form of strips which are found on either side of the GPU. It has a white LED light and also flaunts the logo for Zotac. Moreover, the Zotac mini is equipped with a metallic backplate which improves the overall cooling capacity of the already efficient cooling fans. Aside from this, the backplate which houses the GPU protects it from physical stress and damage. In terms of connectivity, the Zotac Mini houses 1 HDMI 2.0 as well as 1 DVI D. Because of this, the GPU can connect effortlessly with a high-resolution monitor and TV. It consumes only a meager 250 W when used and required a PSU rating of 600W. The next entry on our list is yet another high-quality offering from Zotac. 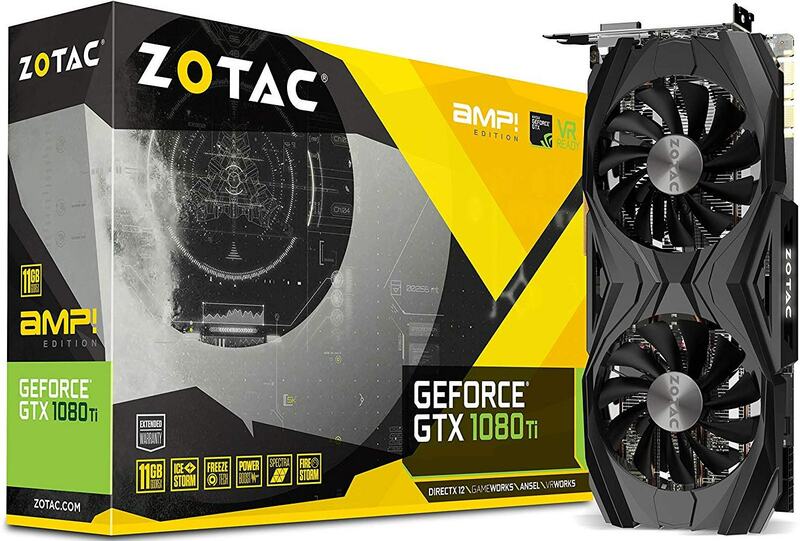 This time we will talk about the previous’ bigger sibling, the Zotac GeForce GTX 1080 ti AMP edition. Compared to the previous model mentioned, the Amp edition simply amps up the size as well as performance in a somewhat similar setup. This graphics card makes use of the same cooling system which keeps the heat at bay. In terms of looks, the amp edition does not steer too far from the mini edition. It dons the same dominant grey color that is accented with sleek stripes to make things interesting. What’s missing is the white LED lighting. It also has an identical metallic backplate which houses the majority of the GPU to keep the internals safe from physical stress and damage. One thing that significantly differs from the mini version is, of course, its size. It’s simply larger. This GOU is clocked at 1569 which offers fast speeds and performance. In fact, you can boost it to 1683 MHz. It has a power consumption of 270W and has a PSU of 600W. In terms of connectivity, it dons the same 1 HDMI port and 1 DVI-D port setup from the mini version. The third entry on our list is another reputable partner of Nvidia. For years, they are one of the key producers of Nvidia graphics cards. In this part, we will feature the highly capable EVGA GeForce GTX 1080 ti FTW3 Gaming. 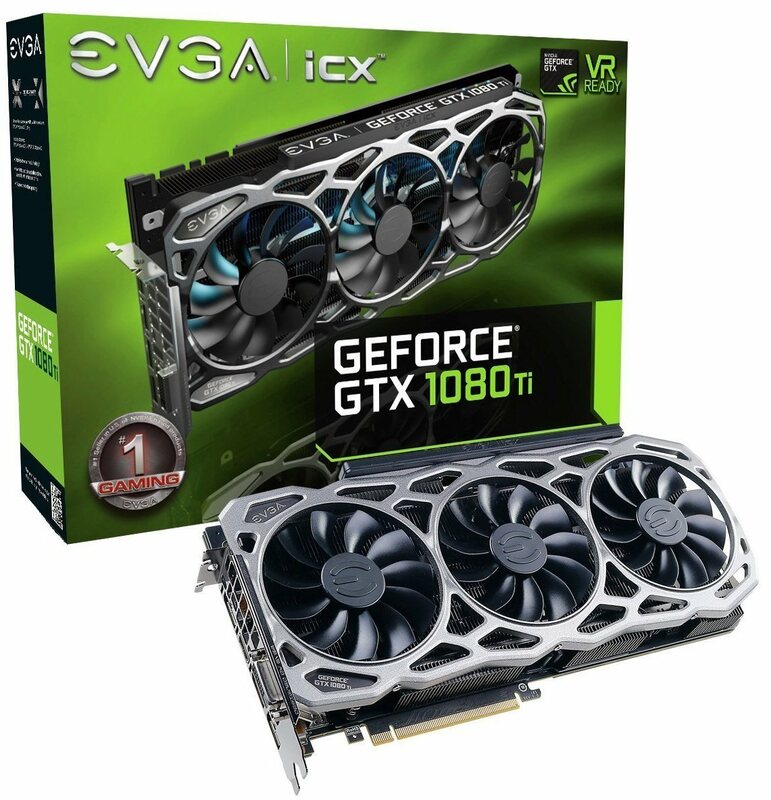 EVGA is known to produce graphics cards that eke out higher clock speeds compared to the other models sold in the market. The FTW3 dons a sleek yet minimalistic design which signifies how the company prefers to prioritize power overlooks. better airflow management. The design though can be to uninspired for some but we admired how the company preferred to focus on function as well as performance than the design. Because of the more efficient airflow management of the GPU, the FTW3 manages to achieve higher overclocking capabilities. The FTW3 is equipped with 3 DisplayPort, 1 HDMI port and 1 DVI-D port. It can support a connection to ultra-high definition screens without a hassle. The GPU is clocked at 1569 MHz which can be boosted up to speeds of 1683 MHz. 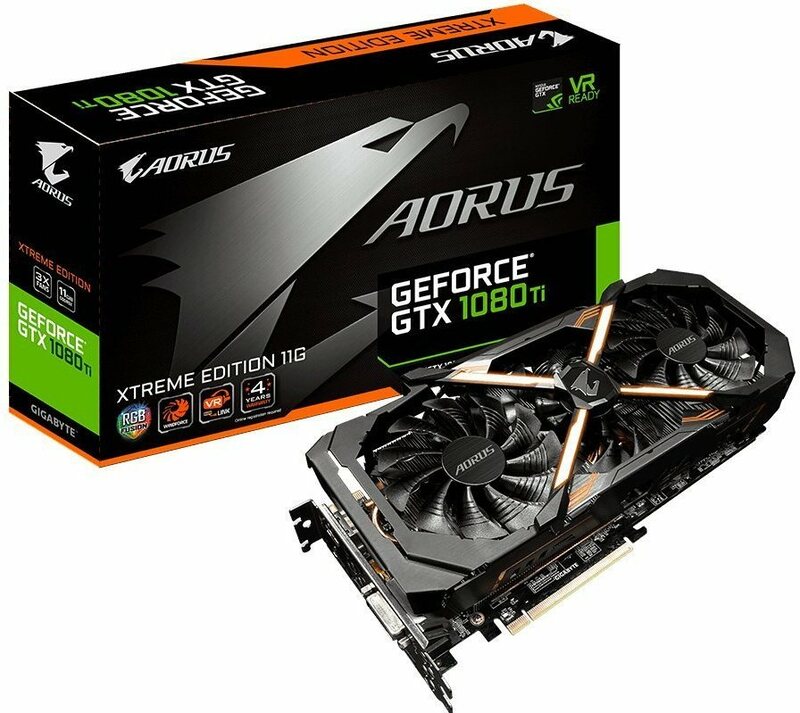 Another model worth of being called one of the best 1080 ti graphics card of 2018 is the Gigabyte AORUS GeForce GTX 1080 Ti Xtreme Edition. Gigabyte, a company that is perhaps very familiar to consumers across the globe has been manufacturing high-quality products over the years, this is one of several. Gigabyte AORUS GeForce GTX 1080 Ti Xtreme Edition is one of the most powerful and speedy GPUs available in the market right now. It can handle most graphics designers or gamers intense needs from a GPU. The GPU excels in providing excellent airflow management thanks to its triple fan setup. Despite its small and compact form factor, the GPU is able to fit in three fans to effectively provide an efficient cooling system. One thing that sets the Gigabyte AORUS GeForce GTX 1080 Ti Xtreme Edition from the others in the market is its VR link capability. Moreover, it is equipped with an HDMI which is conveniently placed in the front for easy access and connection to a VR screen. In terms of design, the Gigabyte AORUS GeForce GTX 1080 Ti Xtreme Edition has a sleeker look than its contemporaries. It boasts vibrant orange strips along with its grey dominated build. It is also equipped with RGB fusion. It dons four strips seamlessly placed on the front which resembles an X pattern. The logo is placed on the center which is also backlit. Basically, the design screams “cool” from the get-go. It has three DisplayPorts and impressively, three HDMI ports. The GPU can be connected to ultra HD screens without any worry. It has a GPU Clock of 1607 MHz which can be boosted up to 1746 MHz. With all these specifications at hand you might think that it requires a ton of power but apparently, it only consumes 250W. We now reach the end of our list. What better way to end it with another excellent offering. This time, we will talk about the MSI GTX 1080 Ti GAMING X TRIO. Having a TRIO on its name, it implies that the product makes use of a triple fan cooling system. Because of this, the product excels in providing excellent airflow management, thereby translating to a more stable operation. These fans are made of high-quality Torx 2.0 material. They also possess double ball bearings which are responsible for proving efficient airflow without the unnecessary noise. It comes in a compact form factor and fits almost all computer cases and motherboards. It flaunts a sleek yet understated design which is reminiscent of most MSI GPUs. It dons a dominant black design with grey outer streaks. It also has red accents that embellish the neutral look of it. The backplate it is equipped with dons an RGB stripe as well as an MSI logo which is backlit. The GPU clock speed is 1544 MHz which can be boosted to 1683 MHz. The market is surrounded with several graphics card, however, not all of these produce the same gaming prowess and build quality. Because of this, you need to narrow down your options so that you can weed out those that aren’t simply up to the gold standard. As you already know, graphics cards often take a beating when used for long periods of time. Without being careful, they can overheat and result in damage. Because of this, make sure to equip yourself with a graphics card with some sort of efficient cooling system. Graphics card cooling systems can either be through the air or liquid cooling. However, we suggest that you buy one with air cooling. Liquid cooled graphics cards are typically more efficient. They save a lot of space on your gaming rig and they can keep the card cool for longer periods of time. However, they do come with a hefty price tag and they are generally limited in the market. Air cooled graphics card also do the job as good as liquid cooled ones. There is only a slight difference in the attained temperature between the two. These type of graphics cards also need a bigger space because of the built-in blower fans. Make sure you still have enough space to accommodate the complete setup on your gaming rig. Air cooled graphics cards often come with two types of air blowers. They could either have a dual or triple fan setup. Dual fan blowers are generally cheaper and of course smaller. Triple fan setups are surprisingly quieter. This is because the higher number of fans would mean a smaller velocity requirement for each of the fans to cool the heatsink. A noticeable noise is only experienced when the graphics card is overworked. Moreover, since there are more fans running, triple fan setups have a better heat management, leading to better overall cooling. With that being said, triple fan graphics cards are generally a better choice compared to dual fan cards. Much like any other component of a gaming rig, you also need to consider its size and form factor. Since you are placing the graphics card in your gaming rig, you need to measure the required minimum length that fits perfectly. 1080 Ti, regardless of its manufacturer, usually fit a Midi Tower case. However, there are also those that require additional space that diminishes the HDD rack size. The graphics card’s width is also a huge factor as this may affect how it fits on the motherboard. Because of the large heatsinks, they are equipped with, the graphics card can span up to three slots on a motherboard. Keep this in mind, especially if you have other components to install on the motherboard such as extension cards. Another important factor to consider is hardware compatibility. To allow the graphics card to work efficiently, it needs to be compatible with the motherboard, CPU as well as the power supply. When it comes to the motherboard, assessing compatibility is rather simple. The only thing you need to look into is whether the motherboard is equipped with the PCI 3.0 that goes with the card. Because this is the usual setup for most motherboards, normally, newly released graphics card are compatible. In terms of the CPU, the key factor you need to consider is its power. The CPU should be powerful enough to allow the graphics card to run to its full capacity. A weak CPU can cause bottlenecking which is a term used in the IT industry which means holding back a full capacity of a certain component. GTX 1080 cards, regardless of its manufacturer would need an Intel Core i5 processor. Anything older or less powerful than an Intel Core i5 will tend to bottleneck the 1080 ti graphics card. Adding more GPUs to your gaming rig would mean that you also need to ramp up the required processor speed. In this case, you might need an Intel Core i7 or a Ryzen 7, anything more powerful than an Intel Core i5. Lastly, the setup’s power supply is another factor you should look into. Most graphics card require a certain amount of power to function properly. For example, the required PSU power a 1080 Ti needs are at least 600 Watts. A more demanding setup and frequent overclocking will also require a higher PSU power. Much like any device or any product for that matter, the manufacturer’s reputation is a huge factor. Leading the graphics card manufacturers is Nvidia. They churn out the most reliable graphics card aside from providing top of the line power and speed. Different brands have their own approach in manufacturing their graphics cards. They put their own stamp on it and cause them to stand above the rest in terms of a few aspects. The specifications that usually differ from brand to brand are the clock rates, cooling system and of course, design. 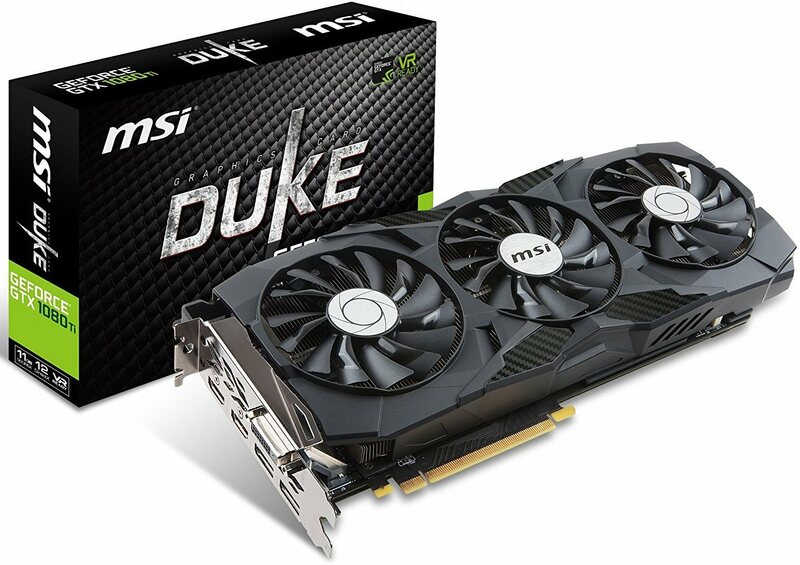 It is best that you equip yourself with a graphics card that is manufactured by a reputable brand- one that can offer great value for your money aside from delivering quality build and specifications. Each variation of the 1080 ti graphics card is equipped with the usual ports for display, HDMI as well as DVI-D. Some models are equipped with only one of these ports. So how do you know which type of port you should prioritize? DVI is the most dated type of port out of these three. Graphics card with this type of port usually has trouble connecting to modern types of monitors. DVI technology does not have access to 4K or ultra High definition displays and can only support 1080p monitors. Moreover, DVI ports do not have the capability of transferring sound. Manufacturers often integrate their graphics cards with DisplayPort and HDMI. They remain to be the standard for most graphics cards nowadays. DisplayPorts are the go-to connection for monitors while HDMI ports are preferred if you want to connect your gaming rig to a television. More often than not, most graphics cards have both of these ports. In terms of support to higher resolution and refresh rates, DisplayPort fare better. The difference is actually very minuscule when it comes to the output of the two ports. HDMI configurations also come in two setups, these are the 3x DP/1x HDMI as well as the 2x DP/2x. Choosing which of these two you would prefer depends on your gaming requirements. If you plan on working on three monitors then it is also required that you have three DisplayPorts. These ports are very important if you want to have the gain your graphics card’s full potential. Those are the models that best fit the accolade of being one of the best 1080 Ti graphics cards of 2018. Make sure to check out these cards so that you can satisfy your intense gaming or designing needs.